When Blake and Carrie Gracie moved their oldest daughter to Holy Family Parish Primary School, Gowrie, little did they know they were on the journey to becoming Catholics. Last year, when Tahlia was in Year 1, her teacher was discussing Baptism. Miss Galvin, who had been baptised as an adult, shared her experience with the class. Tahlia’s classmates spoke about their own Baptism, including why their parents chose their name. Something must have clicked in Tahlia’s heart, because she then asked her parents if she could be baptised. Somehow this did not surprise them. They had overheard Tahlias ‘talking to God’ as they passed her bedroom at night, and she was often sharing with them what she had learned in her religion class. Carrie approached the Parish Team to see what could be done. Fr Luke explained that for Tahlia, and possibly their younger son, Liam, to be baptised, the parents would need to attend the Rite of Christian Initiation of Adults (RCIA) process, so that they could be fully informed about what their children were undertaking. There was no pressure on Carrie and Blake to become Catholics, but it was made clear that their role as parents in raising their children in the Catholic faith was paramount. They accepted the invitation, and joined the regular meetings and attended Mass with others interested in becoming Catholics. Like ducks to water, the Gracie family seemed to fall naturally into the Catholic community. Blake and Carrie’s religious experience was almost nil, although Blake had attended a few Sunday school lessons as a boy (but had not been the model pupil!). A civil celebrant officiated at their wedding but there were no religious rituals used in the ceremony. I wondered about the scandal of sexual abuse within the church and asked did that challenge their wish to become Catholic? They said they were actually very surprised how, from the Archbishop down to the priests and parish leaders, it was a topic openly discussed. 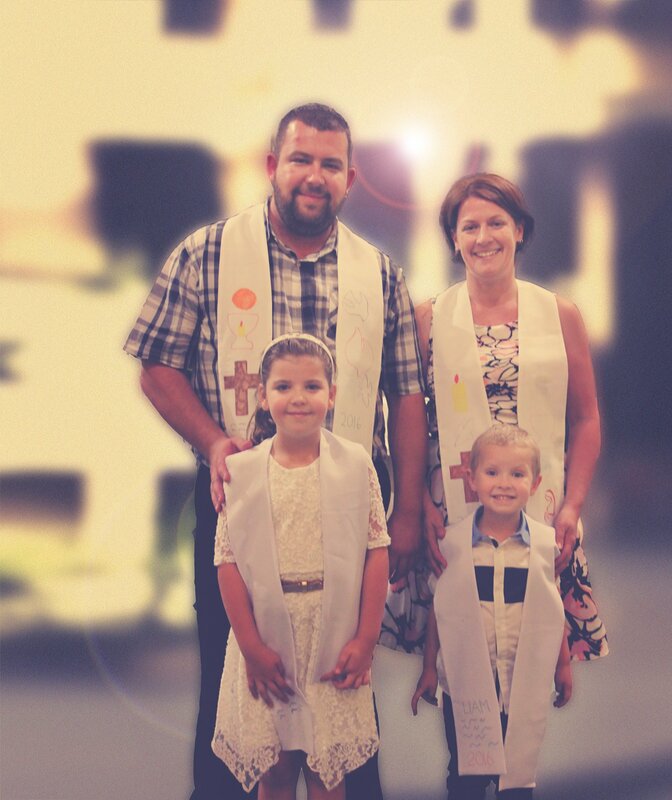 Like any organisation or community, imperfection exists, and Carrie and Blake felt that their RCIA team leaders were not shying away from the wrongs of the past. Looking to the future, I asked what difference does this decision make to their lives. Their first response was that maybe it didn’t make a huge difference as they were naturally aligned to the values of the Catholic Church. But then they began to tease the question out a bit. Blake said going to Mass “has been an opportunity for us to do something together, as a family, every week. It’s made us closer”. Carrie agreed, saying that their lives are really busy with Blake sometimes having to work weekends, and herself working as a legal assistant three days a week, and studying midwifery another three days. She said that the weekly classes allowed the two of them to spend time together and to meet others travelling the same journey. As a family, when deciding how to approach a certain dilemma, especially with the children, they consider ‘what might Jesus do?’ in this situation. If you are interested in learning more about the Catholic faith, contact your local parish office. Parish details can be found at www.cg.catholic.org.au. Or, contact the Archbishop’s Office for Evangelisation on 6163 4300.